CAMP HANSEN, OKINAWA, Japan – More than 130 Japanese officer candidates visited an artillery battery to learn about Marine artillery Sept 27. 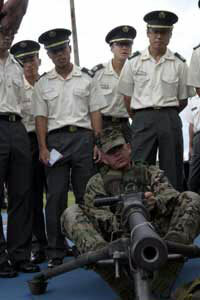 The Marines with L Battery, 3rd Battalion, 12th Marine Regiment, 3rd Marine Division, hosted cadets with the Japanese Ground Self Defense Force as part of the Japanese Observer Program. The candidates were taught the functional areas of an artillery battery including a M-198 155mm Medium Towed Howitzer demonstration, and Marine Corps crew-served and personal weapons familiarization. The day began with a briefing from the battery commander, Capt. David L. Padilla. 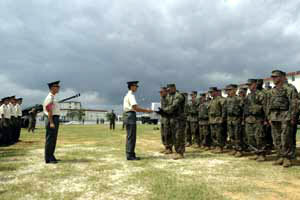 He taught the cadets the history of III MEF and provided them an overview of their current status. Following the brief, the Marines of L Battery demonstrated how a Marine artillery battery provides support in combat. 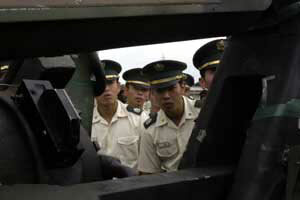 The battery received a simulated call for support, then targeted and fired on the mock enemy. “The students learn a lot from the Marines every time we have a joint event with them,” said Lt. Col. Masaoki Kumashira, the assistant chief of education with the JGSDF OCS. After the demonstration, the Marines taught the cadets howitzer fundamentals, and how to operate a MK-19 40mm machine gun, M-2 ..50 caliber machine gun, M-240G medium machine gun, M-249 squad automatic weapon, M-16A4 service rifle and the M-4A1 carbine.